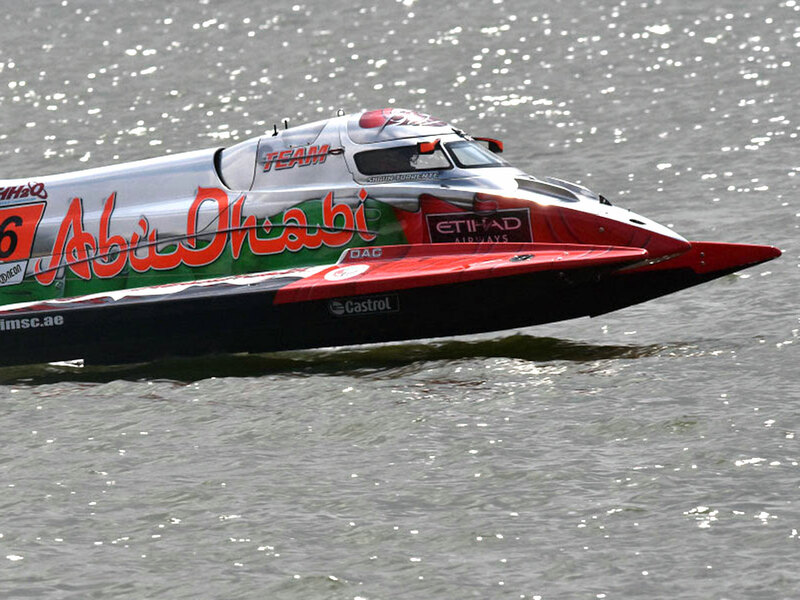 Dubai: Team Abu Dhabi is in the best position to wrap up a rare double heading into this weekend’s Grand Prix of Abu Dhabi — the penultimate round of the 2018 UIM F1H2O World Championships along the Corniche. After Thursday’s free practice, all three Team Abu Dhabi boats looked in good shape heading into a tense weekend that could see their American driver Shaun Torrente challenged by Sweden’s Erik Stark and home hero Thani Al Qamzi for the drivers’ crown. The trio of drivers could also go all out for a clean sweep of the podium for the fourth time this season, thus sealing the teams’ championship title as well with the final round remaining in Sharjah next week. “The idea is to wrap up things as quickly as we can. We have been doing extensive testing for the past two weeks after our arrival from Amaravati, and if everything goes as per plans then I don’t see any reason why we cannot have both the titles for Team Abu Dhabi. We have put in a lot of hard work even before the season commenced and this weekend would be like the prize for all these sacrifices from each and everyone from Team Abu Dhabi,” Torrente told Gulf News from Abu Dhabi. The resident of Miami, Florida heads the drivers’ standings with 72 points, while Stark is chasing him down in second with 65 points and Al Qamzi is in third with 54 making it an all-Abu Dhabi affair this season. The closest challenger to the Team Abu Dhabi trio is Peter Morin — teammate of former four-time world champion Philippe Chiappe of the CTIC F1 Shenzhen China Team — in fourth with 39 points. The teams’ crown could also land in Team Abu Dhabi’s lap as consistent performances in the last five races have seen the trio of drivers compile 126 points, 53 clear of CTIC F1 Shenzhen China Team who are second with 73 points, while Team Amaravati follows in third with 32 points. “It’s just a matter of time for Team Abu Dhabi now. It would be a great achievement to have both titles in one season. But to achieve this in front of your own crowd would be a different feeling altogether. On our part we are fully prepared for the challenge that may be thrown at us by any of the other teams this weekend,” Torrente promised. Friday will start off with a one-hour free practice session from 10.15am, while the BRM qualifying will be held from 3.30pm. There will be a second practice session on Saturday after which the Grand Prix of Abu Dhabi will be flagged off at 3.30pm followed by the presentation of trophies.